History, Design, and Legacy: Architectural Prizes and Medals can be purchased from Wordcatcher Publishing, www.wordcatcher.com, and online retailers such as Amazon from 17th April 2019, priced at £35. 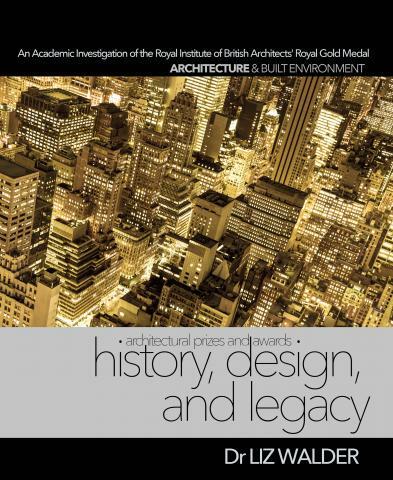 Liz Walder’s long-awaited examination of the Royal Institute of British Architects (RIBA) Royal Gold Medal discusses its royal status and also includes a blueprint of how to win the medal. History, Design, and Legacy: Architectural Prizes and Medals, published by Wordcatcher Publishing, is an in-depth analysis of the annual gold medal awarded by RIBA. Prior to this academic investigation, there was little published about the medal, other than a brief listing of medallists, highlighted in the 150th anniversary edition of RIBA’s Journal in 1984. There has been no detailed work about the medal’s history before this book. Among many other topics, Dr Walder explores the relationship between the monarchy and RIBA, and discusses the question that many architects ponder. Prince Charles has been outspoken on his views on modern architecture and its green credentials. When he is King Charles, how will he view the Royal Medal, and the winners RIBA propose? Across ten chapters, Liz Walder discusses the history, design, and legacy of the RIBA’s Royal Gold Medal, looking at its historical context and future. It covers winners, nominations, formal procedure and modern press campaigns, to place this British architectural medal alongside others awarded across the globe. It also highlights the gender imbalance of winners, with women being massively under-represented in the roll of honour. This work will be of particular interest to: students of architecture; numismatists; those interested in the history of the RIBA; and anyone with an interest in gender equality issues. Part of the Wordcatcher Architecture and Built Environment series, this 215-page, fully-referenced work considers a range of sources including archival and library research, interviews and oral histories, a survey of the living medallists, and statistical analysis. Dr Walder has published essays in every annual RIBA publication about The Royal Gold Medal, 2006-12. History, Design, and Legacy: Architectural Prizes and Medals was originally written as a Thesis submitted in accordance with the requirements of the University of Liverpool for the degree of Doctor in Philosophy on 30th September 2012, and has been typeset and proofread by Wordcatcher to make it accessible beyond the realms of academia. Dr Walder has also published Going for Gold: looking at the gender imbalance of recipients of major architectural awards and prizes in 2018, and has a series of titles scheduled for 2019/2020.